Herman Cain And His ABCs: He Sees Blacks Turning To The GOP : It's All Politics "A lot of people in this country have not realized or it does not get picked up in the polls [that] some black people can think for themselves," the one-time presidential contender said Monday. And there are more "American Black Conservatives," he said, than most people realize. Why is one-time Republican presidential contender Herman Cain optimistic about the GOP bringing more African-Americans into its tent? Because "a lot of people in this country have not realized or it does not get picked up in the polls [that] some black people can think for themselves," he said Monday afternoon. "They don't have to be told what to think and who to vote for and they are responding to the facts." Herman Cain on Monday at the Tampa Convention Center. Cain was talking to an ABC News crew led by Nightline's Terry Moran. But as the GOP's only African-American contender in the 2012 primaries and the ABC crew slowly worked their way through the Tampa Convention Center where most of the news media are camped out, his presence quickly drew a crowd and questions from other reporters. The convention center is where most of the news media have their working spaces for the 2012 Republican Convention in the nearby Tampa Times Forum. 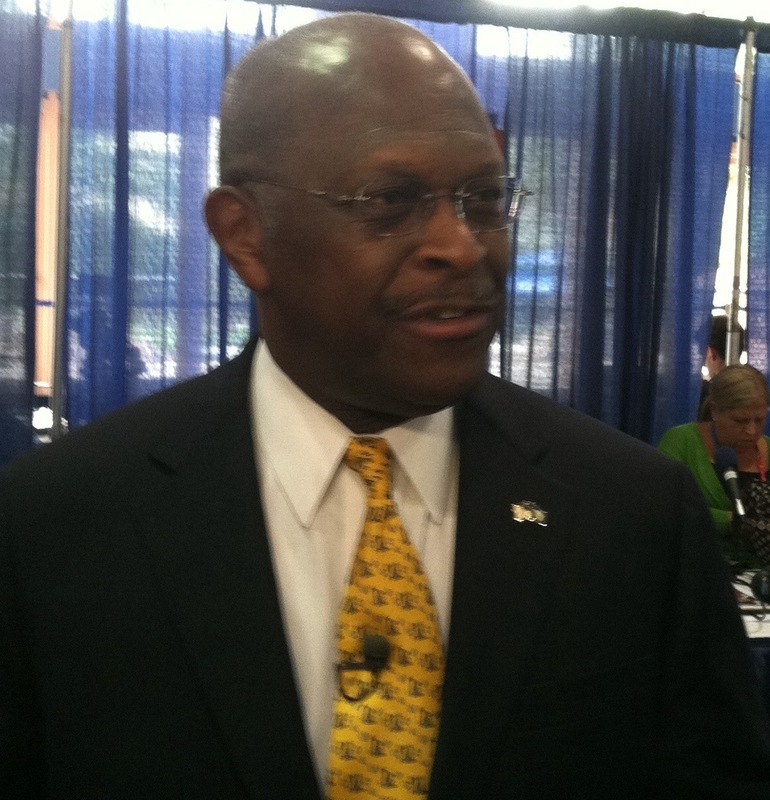 Cain said he's convinced there are many more ABCs — "American black conservatives" — than pundits and politicians think. "I'm an ABC!" he enthusiastically told Moran. And while other blacks "may not be visible as delegates" at the largely white GOP convention, "I know that they are there. There are a lot of closet conservative blacks in this country looking for a home." Why won't blacks, who have overwhelmingly voted Democratic for decades, continue to do so — especially when there's an African-American in the Oval Office? Because President Obama hasn't delivered on the things that all Americans want, Cain said: jobs, a sound budget, strong defense. The one-time business executive, who briefly led the polls during the GOP primary season but saw his bid for the nomination come to an end after allegations of sexual harassment and a woman's claim of a long-time affair with him, also revisited that campaign collapse. Calling the allegations lies, Cain said — as he has before — "there's probably a greater than 50 percent chance I would have been the nominee ... before those attacks." He's now strongly behind Mitt Romney's bid for the White House, added Cain. And he wonders why Romney doesn't do better on polls about "likeability." "Governor Romney is one of the most likeable people out there. ... I like him!," Cain said. "What has happened here — the mainstream media, and the liberals, they have tried to define him as not as likeable as Obama and that is simply not true."